Sometimes my husband, who is a software developer, says that he doesn’t think of himself as creative. But I beg to differ—there is a lot of creativity involved in building things that didn’t exist before, no matter what their genre. Software programs and DIY home projects can be just as creative as novels or artwork. Over the weekend he set up this blog so it can be followed (yay!) in WordPress. That wasn’t just a simple matter of installing a plugin. Although WordPress provides follow capability and other features for self-hosted blogs, they’re all in a big bloated package called Jetpack, which wouldn’t run properly until my husband wrote additional code to turn off some unnecessary and incompatible stuff. There were also style sheet issues he had to fix. It looks like everything is working well now (if you happen to spot any glitches, please let me know). 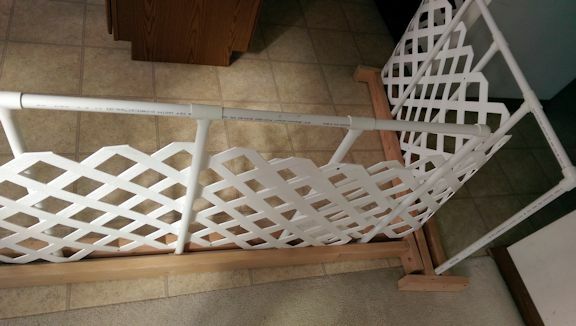 Another weekend project was a dog gate to keep our daughter’s new puppy in the kitchen. 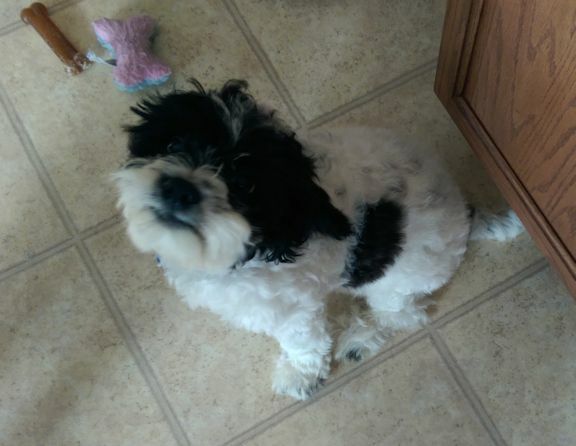 The puppy will be moving to Cleveland with her, but that’s not for another three weeks, and we’d rather not have to clean up surprises on the carpet in the meanwhile. My husband built the gate out of PVC pipe, two strips of plastic lattice, some pieces of wood at the bottom, and plastic feet to make it slide easily without scuffing the linoleum. And here’s a photo of the pooch—she’s four months old, a mix of a Cavalier King Charles Spaniel and a Bichon Frise. She has learned how to sit on command, but still needs some work when it comes to housebreaking. She’s a cute little thing, and very affectionate too—she loves being around people.